Be careful what you wish for. Well I didn’t exactly wish for it, but last night I mentioned I’ve only missed one day in the last year due to illness. At 3:30 this morning I woke with a horrific earache and sore throat. I’ve spent most of the day lying around and really thought I had jinxed myself and would miss my project tonight. A quick cat nap and dinner prepared by my wonderful husband, and I found myself able to function once again. We spent most of the day yesterday in Los Angeles. My nephew lives in Echo Park, and my sister was in for a visit. The architecture in downtown LA is amazing. As much as I’ve grown to love Temecula, I am a city girl at heart. I want to spend a day there just photographing architectural detail. There is an amazing place there called The Last Bookstore. Well worth checking out on-line just to see the incredibly clever art entirely made from books. Dan and I are both horrible book fiends, we have a shared addiction for them. I picked up two books yesterday that both focused on pen and ink. One was a book about illustrated borders. The other is a book on the amazing work of Jean-Ignace-Isidore Grandville (1803-1847). The book contains 266 illustrations from “Un Autre Monde” and “Les Animaux”. In English, “Another World”, and the other section, Les Animaux, which consists of metamorphoses of animals, giving the animals human emotions. The drawings are delightful, and I couldn’t help but be inspired by them. They made me smile. I decided to draw my own “Grandville”. One of my cats, Riley, was kind enough to pose for me (at least her head). Riley sometimes looks lost in thought and gets quite annoyed when we bother her. She is very vocal in letting her displeasure be known. Here is Riley dressed to go to town, looking very bothered my interruption. 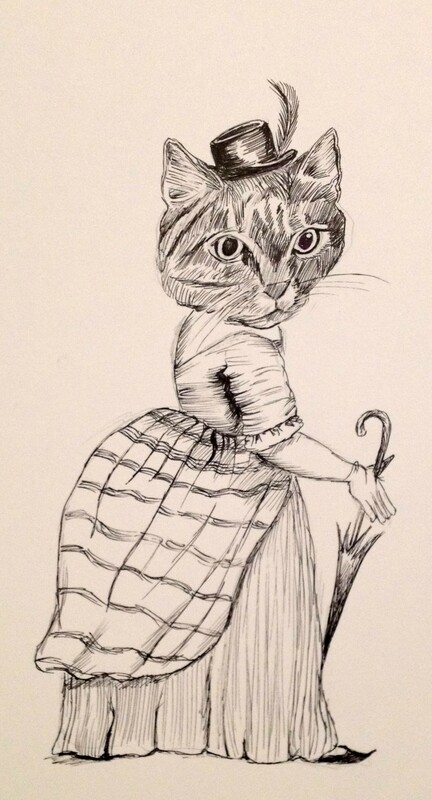 This entry was posted in art, Art and my life, Cats, Drawing, Fine Art, Humor, Pen and Ink, Uncategorized, Words, Writing and tagged art, cats, drawing, Fine art, humor, illustration, Pen and ink, projects, thoughts, Visual arts, writing. Bookmark the permalink.